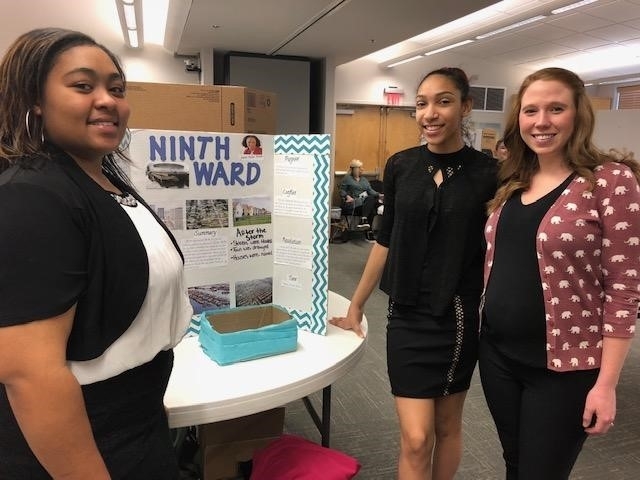 Arkansas Teacher Corps Fellow Courtney Howard (right) stands with her students at the Southwest Arkansas Educational Cooperative Reading Fair in Hope, Arkansas. Howard's students placed first at the fair. Each year, in conjunction with its annual conference, the alternative certification association recognizes the accomplishments of three excellent new educators who were prepared and certified through a non-traditional teacher licensure program. According to award guidelines, nominees should be "exemplary teachers who show passion and commitment to the success of every student" and must submit a written statement, three letters of recommendation and a video of classroom instruction. Award winners participate in the conference, and each of the three receives $1,000. This year's conference, "Addressing Teacher Shortages and Diversity through Alternate Routes," will be March 27-30 in Washington, D.C.
"My first year was incredibly challenging, overwhelming and — in the moments I will cherish forever — rewarding," said Howard. "No matter what obstacle or challenge came my way, I always knew support was available at any time I needed it." "You often hear that teaching can make some feel like they are on a little island trying to survive on their own. This is especially true for new teachers who fear reaching out due to judgment, doubt or the expectation of being able to make it on their own. I am grateful to Arkansas Teacher Corps for being an organization grounded in support and a shared vision for equity in all schools for all students." "ATC teachers come to Hope High School better prepared than any other first-year teachers I have hired," said Principal Bill Hoglund. "The support system from ATC helps our teachers become better teachers almost immediately." "Courtney's ability to work collegially with our staff has enhanced our entire English department, and her willingness to take the lead in team meetings has impacted our school culture. I cannot say enough good things about her work ethic, determination and impact on students." According to Hoglund, Howard's ninth-grade English students have consistently scored the highest at the school on the ACT Aspire exam. To become an Arkansas Teacher Corps fellow, applicants are required to have a bachelor's degree in any major, a record of academic success and a community-focused mindset emphasizing leadership and service learning. Fellows attend a rigorous seven-week residential summer training, which includes more than 150 hours of professional development and clinical practice as a summer-school teacher.